Buying bras can be challenging, even when you know your bra size. Different types of styles fit differently, as do different brands, which is challenging when you're buying bras from different countries using different sizing systems. LACE stocks a variety of bras from all across Europe including France, Germany, Belgium, Poland and the UK. Why are the sizes different? In the EU, brands use the Metric system, and in the UK, they follow the Imperial system. This is why we see different sizes between the two systems, as this also affects the way the bras are graded for size and measured. It's important to note that the size conversions labelled on the bras are often inaccurate. Because of the different sizing and grading systems used in each country, it's impossible for them to have equivalents as there are overlaps between the cup sizes as shown in the table below, which will give you a starting point between the different cup sizing systems. In our experience as bra-fitters at LACE, if you are a G cup in a UK brand, like Freya, it is most likely you are an H cup in an EU brand like PrimaDonna. Please note, not all brands use the same conversions. For more information on the sizing conversions for each brand, click 'Size Guide' on each product page located above the 'ADD TO CART' button. Most continental European countries use EU sizing and have the band sizes labelled in centimetres. LACE stocks band sizes from 65 - 95. As a starting point to find your EU band size, a rough guide is to firmly measure your ribcage and round to the nearest increment of 5, as band sizes are labelled in multiples of 5 centimetres. EU cup sizes increase following the alphabet, using the cup sizes D, E, F, G, H, I, J, K & L.
For more information on how to find your size, please visit the Bra Sizing page. Also, it's important to note that EU brands differ structurally from UK brands. The cups are often not as projected, attributing to a different wire shape, usually slightly wider, and fabrics and embroideries are typically more elastic and flexible. Some women find that the centre front of wired bras on EU brands don't sit as tight against their chest as UK brands, and similarly, some women find UK underwired bras uncomfortable with too much pressure on the sternum. UK sizing is different, in that it uses the Imperial measurement system and band sizes are in inches. 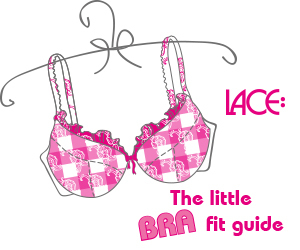 LACE carries sizes band sizes 28 - 42, which is the equivalent to EU 60 - 95. To find your UK band measurement, measure your ribcage firmly in inches, round to the nearest even number, and then try the equal band size as a starting point. Cup sizes progress using double-letters, although there is no 'EE' and the letter 'I' is skipped altogether. For example D, DD, E, F, FF, G, GG, H, HH, J, JJ & K.
Please note that UK double-letter sizes DD, FF, GG, HH & JJ are not 'half a cup' size. For example, there is one full cup size difference between a G and GG cup. The size difference between UK cup sizes is smaller than that of EU cup sizes. For example, the difference between a UK 75G and 75GG cup is smaller than the difference between an EU 75G and 75H cup. UK brands generally have narrower shaped wires than that of EU brands, and the fabrics are firmer with less flexibility. Because of these differences, we see a smaller difference between each cup size, and more sizes available when comparing to traditional EU sizing. Polish bras are becoming more widely available in Western Europe, and their sizing is slightly different from traditional EU sizing. The band sizes follow the same 5cm increments as the EU, but each brand has its philosophy and sizing system for the cups. Ewa Michalak uses a sizing system similar to UK sizing with cup sizes following the D, DD, E, F, FF pattern, while Kris Line also uses a similar system with double letters, which also includes an “I cup", which is not typical for the UK sizing systems. Polish bra bands tend to fit firm, enough that some ladies require a band size larger, and the cup sizes from some brands can fit slightly smaller than the UK sizing. Polish brands are known for their very narrow wires and cup projection, which is more pronounced than UK brands.